Collagen production is necessary for healthy hair, skin, and nails. As we age, we lose collagen which results in sagging skin, wrinkles, and can even affect bone health. A natural collagen boost can be very helpful, but most collagen supplements are animal-based. Gelatin is a popular collagen source, but it is the gelatinous result of boiled skin, tendons, and bones. It’s pretty gross, so why consume it? Avoid the cruelty altogether and use a natural, plant-based supplement that can help boost your collagen production. Plenty of vitamins and minerals like Copper, zinc, B vitamins, vitamin A, vitamin C, and vitamin E to name a few are proven to be helpful. We put together a list of 10 plant-based collagen boosting supplements available on Amazon to help you achieve the healthy hair, skin, and nails that you deserve! 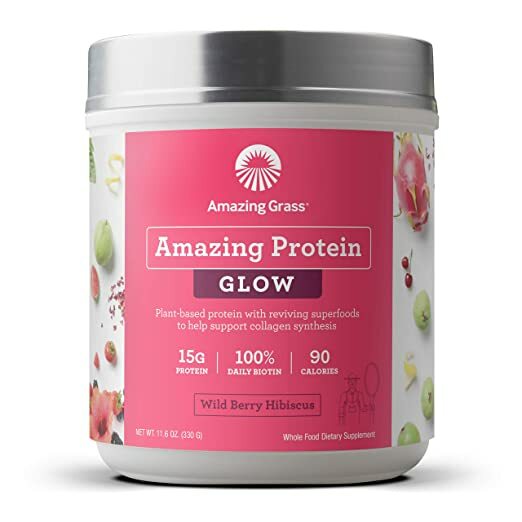 Glow Collagen Support by Amazing Grass supports collagen synthesis with vitamin C from organic acerola cherry. Glow also contains 100 percent of your biotin, also completely plant-based. It also has B complex and C vitamins and is made with organic, plant-based protein with reviving superfoods. Each serving packs 15g of vegan protein. The organic rose petal also helps provide full body radiance, along with the biotin and collagen support. It’s available in three flavors: Berry, Chocolate, and Vanilla. The price for 15 servings is $22.80. 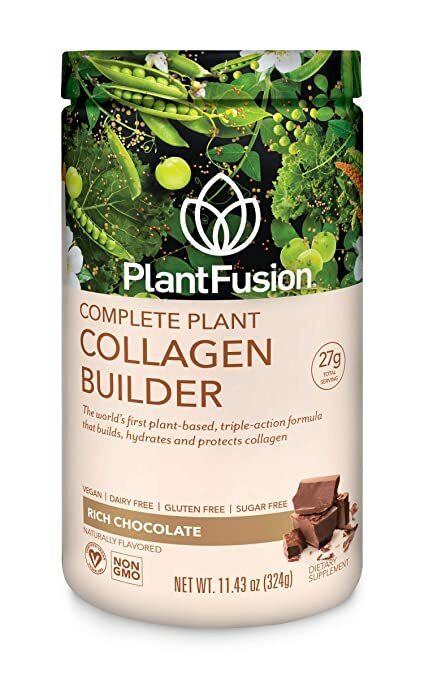 PlantFusion’s Complete Plant Collagen Builder is a certified non-GMO, gluten-free, dairy-free, and completely plant-based collagen powder. It’s made with a unique blend of Saberry amla fruit extract, amino acids proline and glycine, and plant protein. Oxyphyte, the powerful white tea extract work with hyaluronic acid to prevent collagen breakdown. The ceramides oils in the powder also make up 35-40% of the natural oils that form the skin’s barrier and help it retain moisture. It is available in three flavors: unflavored, vanilla, and chocolate. The price for 10.5 ounces is $36.99 and $56.99 for one pound. 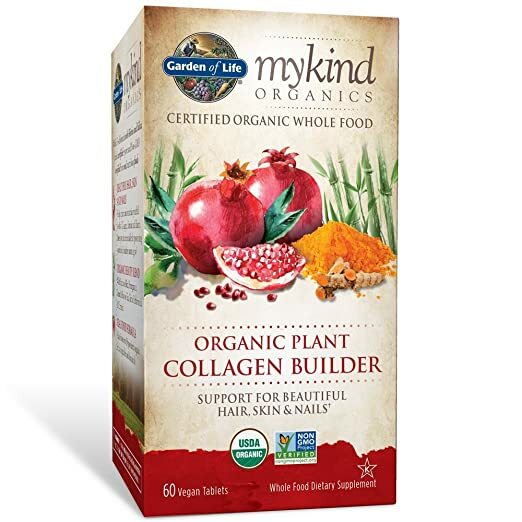 Garden of Life’s mykind Organic Plant Collagen Builder helps the body with its own natural production of collagen with collagen co-nutrients like silica. It includes high polyphenolic pomegranate which helps support skin health and protect against UV damage. This collagen builder also contains 1,500 mg of plant-based biotin derived from organic sesbania, pomegranate, turmeric, amla, green and rooibos tea. As well as being vegan and organic, it’s also non-GMO, gluten-free, and kosher. The price for 60 tablets is $23.79 and $79.85 for 120 tablets. 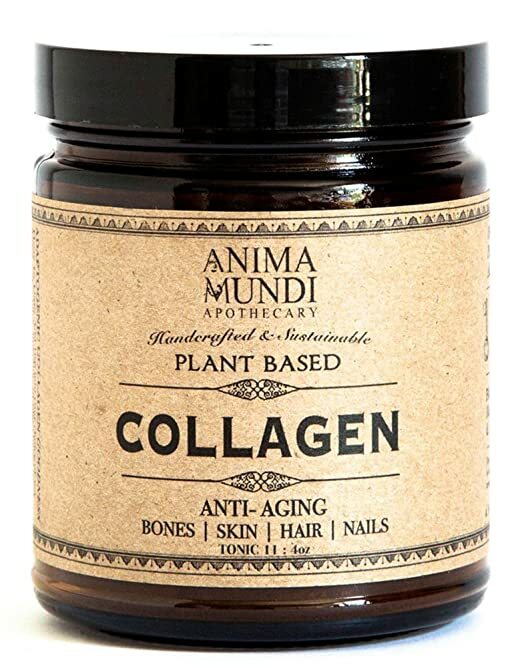 Anima Mundi Apothecary’s Collagen Boosting Supplement is made with a mix of collagen-promoting adaptogens, ancient herbs, and flowers. Some of the herbs used include horsetail and nettle which contain the collagen co-nutrients silica and calcium, and the adaptogenic ingredients include Fo-Ti (He Shou Wu) and Gynostemma. This product is also non-GMO, gluten-free, and uses fair-trade practices. The price for four ounces is $28.99. 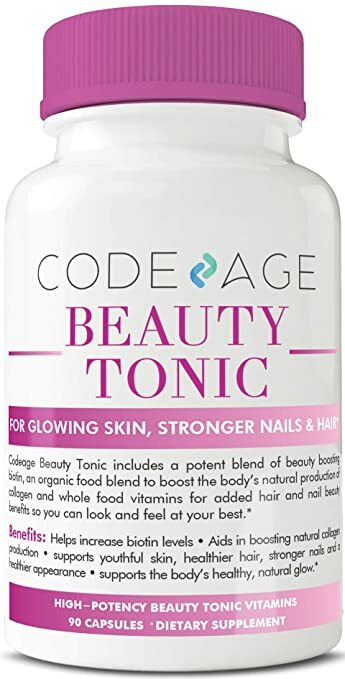 Code Age Beauty Tonic Collagen Booster has a combination of biotin, nutrient-rich phytoceramides, antioxidants, whole food vitamins, and minerals. The food blend consists of sesbania, guava, alma berry, holy basil, lemon peel, annatto, bamboo shoot, and mustard seed. It’s non-GMO, organic, and contains no fillers, artificial flavors, colors, sweeteners, or preservatives. The price for 90 capsules is $29.99. 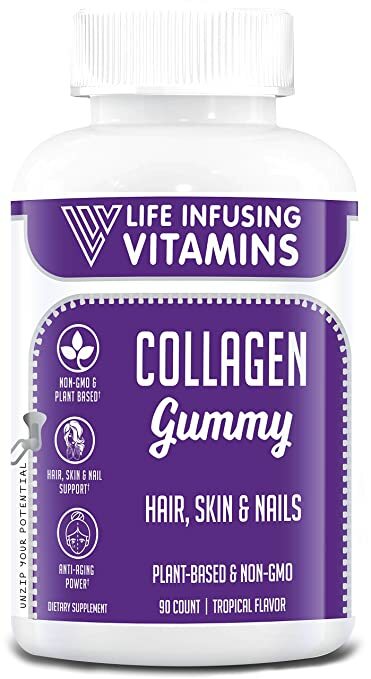 Life Infusing Vitamins’ Collagen Gummies are non-GMO, gluten-free, nut-free, grain-free, and dairy-free. They contain no antibiotics or artificial preservatives. It’s halal-certified, kosher, and pectin-based. A bottle of 90 capsules costs $14.99. 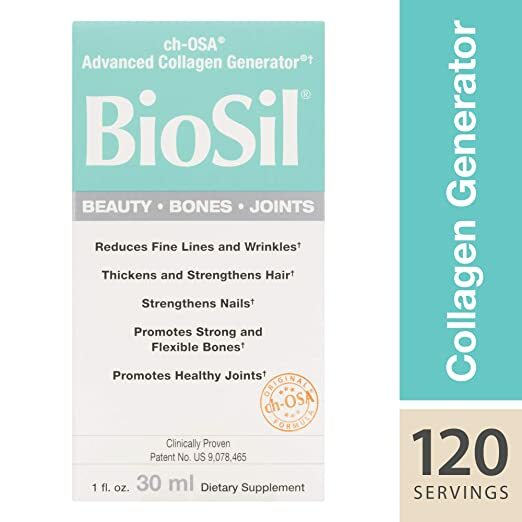 BioSil by Natural Factors encourages collagen production to keep your skin healthy, plump and avoid wrinkles and fine lines. Choline, the secret ingredient in this product, helps generate collagen and keratin to support healthy hair and nails. It can also strengthen cartilage and bone thanks to the collagen support. This supplement comes in liquid form and is taken as drops. The price for one ounce is $25.29. 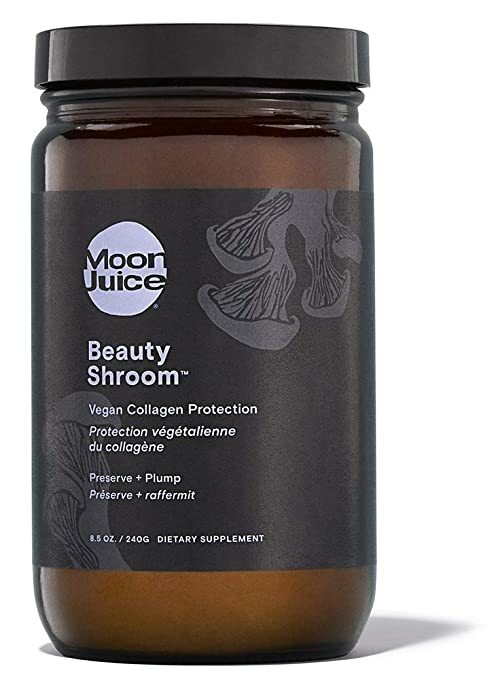 Beauty Shroom Vegan Collagen Protection by Moon Juice is a blend of skin-protecting superfoods to help with collagen production, but also skin hydration. It’s soy-free, gluten-free, non-GMO, and does not contain fillers. The price for 8.5 ounces is $58.00. 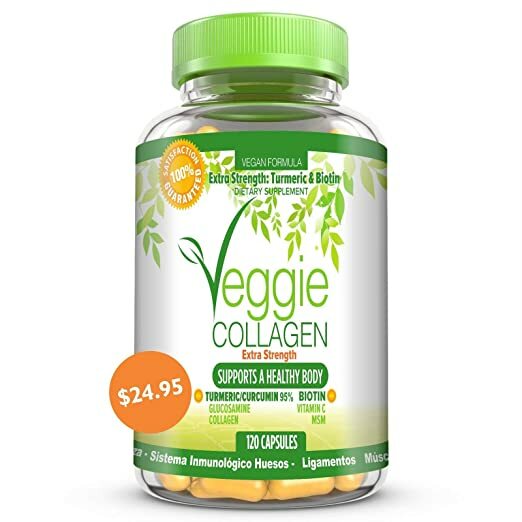 Veggie Collagen Capsules contain MSM, glucosamine, and vitamin C. They also have turmeric, which contain a whole other myriad of health benefits and biotin, which share many of the same benefits as collagen in terms of hair and skin health. The price for 120 capsules is $24.95. 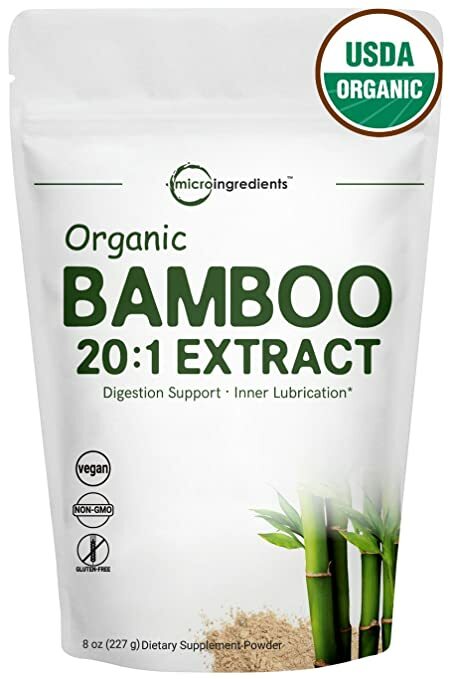 Organic Bamboo Extract Powder is another alternative to animal collagen products because it supports healthy skin, nail, hair, joints and bones with minerals and silica. It’s rich in antioxidants and minerals like zinc, copper, magnesium, calcium, silica, and potassium. It’s GMO-free, soy-free, gluten-free, and does not contain any additives, preservatives, artificial colors, or fillers. The price 8 ounces is $20.95. If you’d like more natural resources, check out Raw Nuts and Seeds That Support Collagen Production in the Body, How Eating Plant-Based Has the Power to Keep You Aging Healthfully, and 5 Everyday Superfoods For Your Nails, Hair, and Skin.